The number of children in poverty in the region fell from 32 million to 18 million between 1998 and 2003, but this was largely because of a fall in the child population, due to falling fertility rates, the study concluded. The report paints a picture of extreme contrasts. 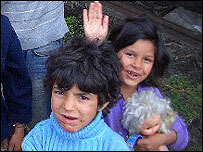 Life for many children has improved in the last decade. But growth has been uneven, with little progress for children in the poorest families. That is especially true for those in rural areas where there is higher unemployment and much less opportunity. The report calls on governments to focus much more on the needs of children in drawing up policy and social support programmes. "Children are invisible really in the development agenda. So there needs to be a specific targeting of the poorest," says Unicef spokesman Lynn Geldof. "They are the larger families, families with more than two children; they are those who have been historically alienated - the Roma communities; they are those in non-nuclear families, and they are those who tend to live in rural areas." The report also highlights what it calls a "demographic crisis" - the dramatic decline in birth rates, especially in South-Eastern Europe. Young families need much more social support, it says, to encourage them to have more children and off-set rapidly ageing populations. There are concerns, too, about the number of children living in institutions. That has not decreased, says the report, despite the overall drop in the number of children being born - and it highlights in particular Bulgaria and Romania. One of the main reasons for children being put in institutions is household poverty, it says. That, too, could be addressed by giving more support to families with young children and also by changing official policy, away from institutions and more towards other solutions for abandoned or displaced children, like foster care, the document says.